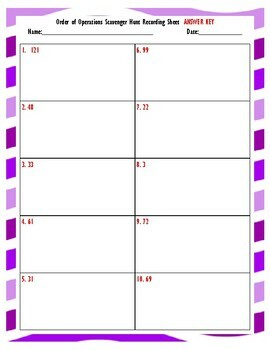 This activity allows students to move throughout the room in pairs or small groups to solve the different expressions. Students may start at any question that is not already taken. After they solve, they move to the question that has the answer they got at the top of it. (This is their “clue”). Ten questions are included. 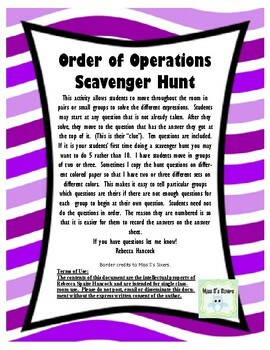 If it is your students’ first time doing a scavenger hunt you may want to do 5 rather than 10. I have students move in groups of two or three. Sometimes I copy the hunt questions on different colored paper so that I have two or three different sets on different colors. This makes it easy to tell particular groups which questions are theirs if there are not enough questions for each group to begin at their own question. Students need not do the questions in order. The reason they are numbered is so that it is easier for them to record the answers on the answer sheet.